Pregnancy exercises are the last thing on your mind when feeling tired and uncoordinated. Throw into the mix not knowing what’s safe for a mama-to-be, and it’s no wonder exercising hits the bottom of the to-do list. However, if you’ve never had an exercise routine, pregnancy is the time to start. Make sure you’ve checked with your prenatal provider as some medical conditions or complications could limit you from certain activities. Then, design an optimal workout (30 minutes of moderate exercise a day) using the safe pregnancy exercises and pregnancy stretches mentioned below, to achieve cardiovascular fitness along with flexibility and strength. Consult with a personal trainer to help plan your pregnancy exercises and you’ll enjoy having more energy, better sleep, strong heart and lungs, and a more manageable weight gain. Walking: A no-excuse way to get your heart pumping without sacrificing your joints, plus it’s safe for your entire pregnancy. Swimming: Not only will you appreciate weightlessness, swimming can help counter the misalignment that happens as your body changes. Avoid twisting your torso by choosing the breaststroke or backstroke. Low-Impact Aerobics or Dance: If you need consistency, take an aerobics or dance class, especially one geared towards moms-to-be. You’ll love the camaraderie and feel good knowing what your doing is safe. You can also find a host of prenatal aerobics videos on the market, Netlfix and You Tube, if you can’t make it to the gym. Stretching / Yoga: Pregnancy stretches and yoga helps tone muscles, improves balance and circulation, and keeps you feeling limber with little impact on your joints. Plus, the relaxation and breathing techniques are handy during labor. 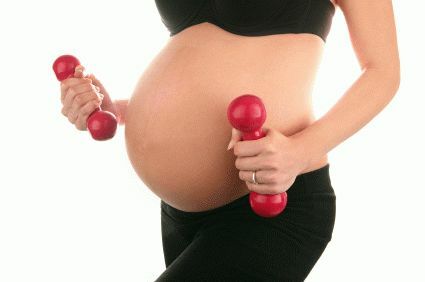 Weight Training: Want to build stamina needed for labor, delivery and motherhood? A personal trainer can design a weight training plan where you’ll increase repetitions and decrease weight. Start by warming up slowly and end with cooling down. Avoid any movements that include jumping, high kicks, leaping or running fast. Avoid laying on your back after the 1st trimester. Steer clear of uneven terrain during the later parts of your pregnancy. If you can’t carry on a conversation, you need to take your workout down a level.